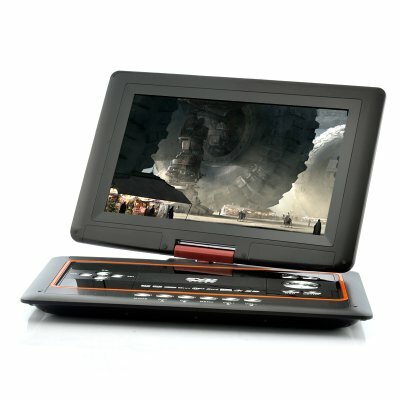 Successfully Added Portable Multimedia 13.3 Inch Screen DVD Player - Copy Function to your Shopping Cart. Portable DVD Player with 13.3 Inch Swivel Screen and Copy Function is ideally sized for you to enjoy your media while you travel. At Chinavasion we enjoy multiple purpose products, and this outstanding multimedia DVD player with a 13.3 inch swivel screen can do multiple functions. You can play the most popular and the most common disc types and file formats like MPEG, MOV, WMA and DivX. Simply plug in your USB flash drive or SD/MMC/MS card and you can instantly watch your downloaded videos or listen to your favorite MP3s. The TV antenna that accompanies this product can be used as well to watch TV directly on to your 13.3 inch conveniently sized swivel screen DVD player. Another clever feature with this Portable DVD player features a disk copy function. Insert a CD and convert the CD track songs into MP3s, and then you can transfer those MP3s onto an MP3 player, phone or your home computer. Portable multimedia DVD player also includes the AV input and AV output. Use the AV IN port to play media files from sources like your camera or camcorder and use AV OUT to connect this portable DVD player to your big screen TV. The 270 degree swivel screen allows you to change, adjust and rotate the screen to suit your comfort. Order your new Portable Multimedia DVD Player with 13.3 Inch Swivel Screen and Copy Function today and take advantage of all its features. Resellers, this is sure to be a favorite with your customers, so stock up for your online shop and enjoy even more savings and bigger profits. From your best source of high quality, low priced wholesale electronics - Chinavasion.